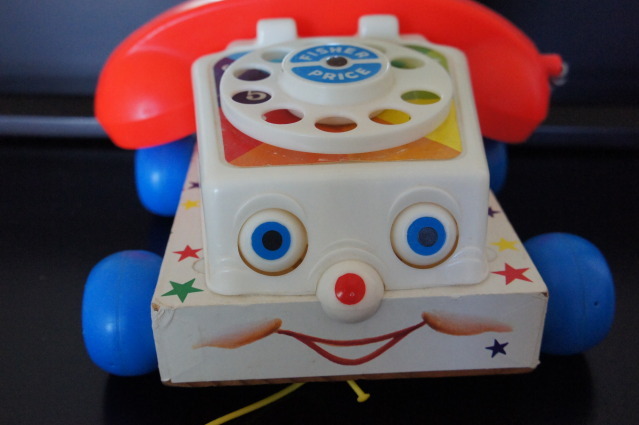 East Aurora, NY – The incredibly popular Fisher Price Chatter Phone, enjoyed by young children across several generations, has been cooperating with National Security Agency surveillance efforts since 2003, documents obtained by The National Protrusion reveal. “We have no comment on this report, as we have not had a chance to review the documents in question,” said Claire Dunleavy, a spokesperson for Fisher Price, said in a statement. According to the documents, the NSA reached a secret agreement with the Chatter Phone to allow NSA operatives to insert a chip inside it, beginning in 2003. That chip then recorded data from each phone call, such as the location and duration of the call, unbeknownst to consumers. The Chatter Phone was released in 1962 as the “Talk Back Phone,” and has been very popular among young children, usually between the ages of 12 and 36 months, ever since. Children pull the toy by a string, and it makes noise. It also allows children to use its rotary dial, which rings a bell, and use the receiver as they might a real phone, thereby teaching them how to use a telephone. It is those pretend phone calls made by children that the NSA apparently wanted to collect data about. Some parents with children who have used the Chatter Phone aren’t assuaged by the NSA’s assurances.